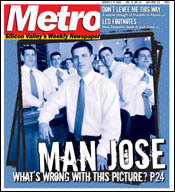 Is San Jose really one big sausage party, or is the 'bachelor capital of the world' tag that's been slapped on this area just a cruel myth? The situation in Alviso has turned ugly between one larger-than-life property owner andwell, everybody else. The Fly: Grand Heft Auto: The Grand Prix was the most exciting auto-related thing to hit San Jose since Clint Eastwood filmed that car chase on what's now known as Highway 85 (that's how old that movie was). Silicon Alleys: Waiting for Miss San Jose Grand Prix. Prix Qualified: More post-Prix coverage. Rev: This Is Not a Car Review: Why would I cruelly choose to review a car not available to you? Because, dear reader, I want you to go to your Honda dealership and demanddemand!the Tourer. Three by Three: A trio of Bay Area art veterans outshine their choices for the next generation at the San Jose Institute of Contemporary Art. Mixing Medias: Three artists at MACLA explore a wide range of techniques and materials in 'Connecting Forms' show. Truly, 'Malady,' Deeply: 'Tropical Malady,' a gay romance from Thailand, ventures into unexplored territory. Kiss Off: Sure sign of aging musicians: outdoor winery concerts. Talent Pool: [email protected]'s opening concert showed off the chamber-music festival's deep bench. Bookbox: 'The Historian' by Elizabeth Kostova and 'The Last Expedition: Stanley's Mad Journey Through the Congo' by Daniel Liebowitz and Charles Pearson. Seoul Searching: San Jose's Red Charcoal could help Korean cuisine find its way into the American mainstream. Silicon Veggie: Eat Like Animals? 5 Places to Love: Great Burger Joints.